Hey, nice view!! ^__^ looks good!....hmm, but I think the buildings should have more textured roofs....anyway, still a nice job! I'd suggest desaturating the background a little bit, because colours fade out the further into the distance the object is. ;) And, instead of having all the windows black, maybe change some to dark brown or something, to better match the buildings they're on? Especially the windows that are facing the light..
May be not your forte but this came out great...pretty big file though....But I'm curious as to all long it took you to make all of this the buildings really look great. sugoi ^___^~! nice work =D those roofs looks funny XD~!!! Sugoiiiiii... Thanks very much to share it with us all.. Very nice wall. 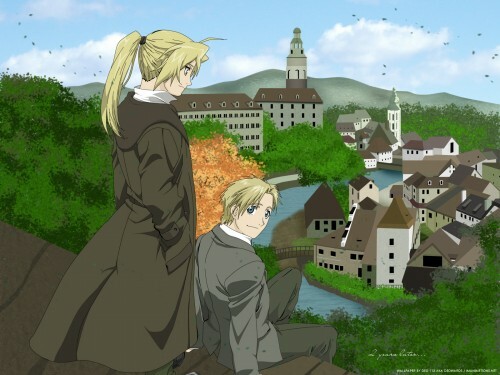 Is Al and Winry looking for Ed???? WoW!! This is a very nice wallpaper. i really love the town, the little houses and buildings are adorable, and are a very nice touch. ...And your vector is just awesome. At least yours turned out really good. as many has commented on the buildings, imma do the same XD all the buildings seem to be the same certain shade, maybe you could put more shadows onto the buildings into the distance? ed looks like a girl!!! wahahahahaha! >:3 *that's not your fault either :D* that little ledge that ed and al are sitting on seems to be a little out on perspective.. especially the left bit which is more to ed's side. You and me bucket-shot! I have to catch up watching and reading! But anyway, my gosh, it's such a fantastic wallpaper! You did an awesome job vectoring Ed and Al, and the buildings. The whole wall is just great and I love the concept! Awesome work! Keep it up!